The political climate in the Netherlands just after the war was scarred by feelings of guilt surrounding its colonial past and the sensitivities of the relationship with Indonesia. As a result, it was a long time before there was official recognition of the suffering of the war victims from the former Dutch-Indies colony and for any attention to be paid to the victims of the Second World War in South-East Asia. Following the placing of an urn in the monument on the Dam, the KNIL Monument in Enschede, the Women’s Monument in Apeldoorn, and the Plaquette in the Lower House of Parliament, in 1988 the Indies Monument in The Hague was erected. HM Queen Beatrix unveiled the Indies Monument on the Teldersweg in 1988. It was designed by Jaroslawa Dankowa, a Dutch artist of Bulgarian origin who has lived and worked in The Hague for many years. The Monument is a memorial to the victims of the war which the Netherlands waged against Japan from 1941 to 1945 in the former Dutch Indies (nowadays Indonesia). It shows seventeen bronze figures of various ages in front of a high lattice fence built around a bier. 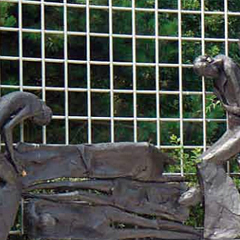 The figures represent the many faces of suffering: the pain, the despair and the resistance. On a bier in the centre lie the dead, flanked on both sides by figures of women, grieving. The figures on the outer sides represent liberation. They have woken up and in fighting spirit, with their heads raised and their fists clenched, they face the future. Set in the middle of the Monument, the map of Indonesia has been built into the design. For some the high fence symbolises solidarity, for others the walls which imprisoned them. On the left of the Monument the text reads “8 dec. 1941-15 aug. 1945”. The dates mark the Netherland’s declaration of war on Japan and the capitulation of Japan after the Americans bombarded the Japanese cities of Hiroshima and Nagasaki. The official end of the Second World War for the Netherlands in 1945 was not on 5 May but on 15 August. 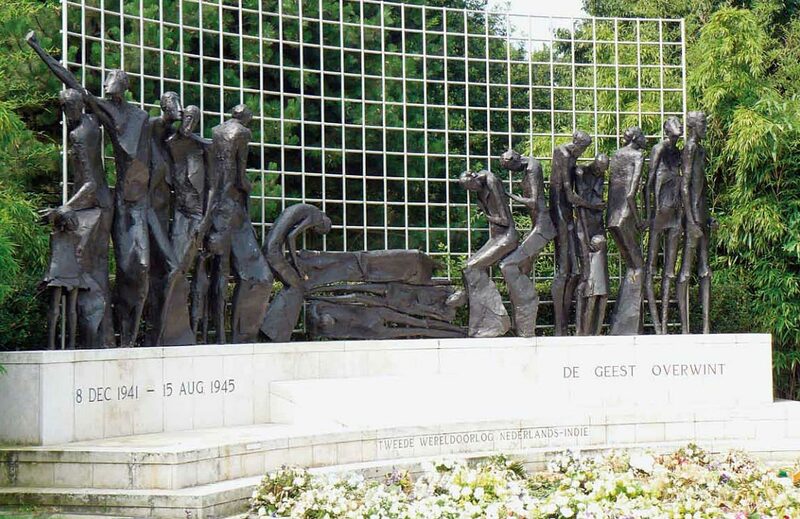 The text on the right of the monument, “De Geest overwint”, is virtually identical to the text on the monuments in the eight war cemeteries in Indonesia and the seven war cemeteries spread throughout South-East Asia where Dutch war victims are buried. The political climate in the Netherlands just after the war was scarred by feelings of guilt surrounding its colonial past and the sensitivities of the relationship with Indonesia. As a result, it was a long time before there was official recognition of the suffering of the war victims from the former Dutch-Indies. 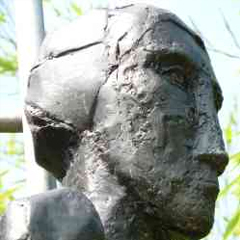 Following the placing of an urn at the monument on the Dam, the KNIL Monument in Enschede, the Women’s Monument in Apeldoorn, and the Plaquette in the Lower House of Parliament, in 1988 the Indies Monument in The Hague was erected. An extensive commemoration of the end of the Second World War in Asia took place for the first time 25 years later on 15 August 1970. 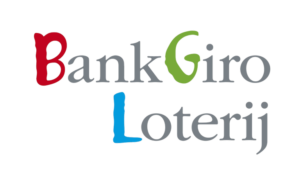 10,000 people, members of the Royal Family and representatives of the government attended. It was 1980 before the next such commemoration, attended by 11,000 people, the Royal couple, members of the government and the Indonesian Ambassador. This was the inception of the annual commemoration of the end of the war in South-East Asia. Its organisation was entrusted to the 15 August 1945 Commemoration Foundation, which was set up by 24 Indies organisations on 15 March 1980. The Indies Monument in The Hague was unveiled in 1988. Its origins formed part of the ‘remembrance culture’ prevailing in the eighties. However, the initiative was not spearheaded by the Indies organisations but by the Advisory Committee for War Commemoration Symbols under the former Ministry of WVC. The Committee was under the leadership of Harry Verheij, who was also a member of the Benefits Board responsible for decisions over the WUV benefit payments to war victims. Consequently, he was very knowledgeable about the suffering which had been caused during the war in South-East Asia and its enduring influence on the lives of those involved. It had to be a monument ‘in the national style’, in keeping with the commemorative tradition of the urn (the Dam) and the Women’s Monument in Apeldoorn/Arnhem. (N.B. The National Monument stands on the Dam in Amsterdam). 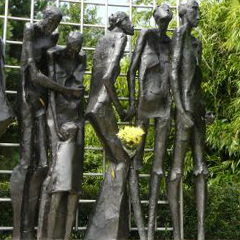 The Monument had to recognise at least four groups of war victims from the period 1941-1945: members of the armed forces, women and children from the camps, prisoners of war, and Indo-Europeans who had been kept mostly outside the camps and were the worst affected group of Indonesian forced labourers, the Romushas. 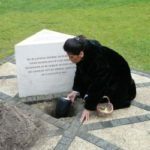 On Wednesday, 12 November 2008, earth from the Galala Tantui War Cemetery on Ambon was reburied at the Indies Monument in The Hague. On behalf of the Moluccan community, Sylvia Pessireron buried the urn with the previously reburied earth from the other war cemeteries in Indonesia. The reburial of the earth from the eight war cemeteries in Indonesia where Dutch war victims are buried created a symbolic connection between these war cemeteries and the place of commemoration: the Indies Monument. This was instigated by the 15 August 1945 Commemoration Foundation. In 2005, the earth from the seven war cemeteries on Java (Ancol and Menteng Pulo in Jakarta, Pandu in Bandung, Leuwigajah in Cimahi, Candi and Kalibanteng in Semarang, and Kembang Kuning in Surabaya) was placed in an urn in the small column in front of the Indies Monument. Owing to the tensions on the Moluccas at that time, it proved too difficult to bring the earth from the Galala Tantui War Cememtery on Ambon to the Netherlands. The reburial of this urn has now fulfilled the wishes of relatives of war victims buried in the war cemetery on Ambon. The short ceremony was attended by representatives of the War Graves Foundation, the 15 August 1945 Commemoration Foundation and the Pelita Foundation. Befor the reburial, Sylvia Pessireron scattered petals and eau de cologne over the urn. The 15 August Commemoration Foundation receives financial support from the V-fonds and the Ministry of Public Health (VWS). The Foundation could also put your support to good use! Currently the Foundation has around 1,600 donors. This edition was the initiative of the 15 August 1945 Commemoration Foundation in memory of the historic origin and the 20-year existence (in 2008) of the Indies Monument. It describes the underlying story and the importance of this monument to the Indies community.